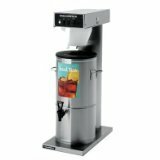 Bloomfield’s Automatic Tea Brewer is designed for ease of operation and service with technician-free installation and start-up. It provides an economic and foolproof way to brew perfect tea, each and every time. If you have any questions about this product by Bloomfield, contact us by completing and submitting the form below. If you are looking for a specif part number, please include it with your message.